On Windows machine (including teaching labs at the University), you will use mobaxterm (google it and download the portable version if you have not done so already) AND NOT putty to log on to the server as it has XServer built into it, allows X11 forwarding, and you can run the softwares that have a GUI. If you are on linux/Mac OS, you can use -Y or -X switch in the ssh command below to allow the same capability. When you have successfully logged on, create a folder CTutorial_YourName, go inside it and do all your processing there! The latest version of CONCOCT requires Python 2.7.x to run. Since the version of python on the server is 2.6.6, we will first create a new bash shell, load pyenv and switch to Python 2.7.8. [MScBioinf@quince-srv2 ~/CTutorial_Umer]$ eval "$(pyenv init -)"
After assembly we map the reads of each sample back to the assembly using bowtie2 and remove PCR duplicates with MarkDuplicates. The coverage histogram for each BAM file is computed with genomeCoverageBed from bedtools. The script that calls these programs is provided with CONCOCT. -p option is the extra parameters given to bowtie2. In this case -f.
Use the BAM files of each sample to create a table with the coverage of each contig per sample. Sometimes we are interested in generating a coverage table from the sequence files where we have lost the paired-end information, for example, in scenarios where we are dealing with human associated microbes after having filtered out our samples for human contaminants using DeconSeq. In such a case, the following steps may be useful for generating a coverage table. Please go through the Linux command line exercises for NGS data processing tutorial to understand BWA, SAMtools, and BEDtools better. Step 4: We remove human contaminants using DeconSeq which will generate two files *clean*.fa and *cont*.fa. Say we get the best assembly done for kmer 121, then we will have a file contig-121.fa in the collated_assembly folder. We need to extract only those contigs that have length > 1000. You can get the following script from here. genomic signature) of each contig. specify kmer length, default 4.
components for the combined data. Specify maximum number of iterations for the VBGMM. transformation. Use this tag to escape this behaviour. -o, --converge_out    Write convergence info to files. CONCOCT Finished, the log shows how it went. The program generates a number of files in the output directory that can be set with the -b parameter and will be the present working directory by default. 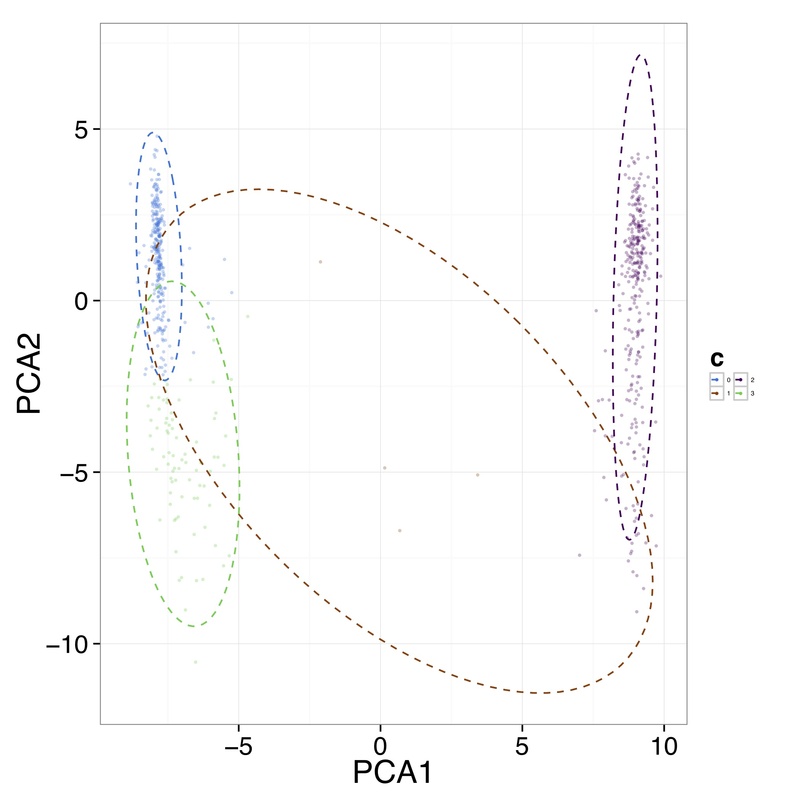 To understand how to validate clustering performance using different clustering indices, read the reference slides on clust_validity.R as well as play with the example datasets. clust_validity.R [Usage] takes a CSV file of N d-dimensional features, performs K-means or dp-means clustering and chooses the optimum number of clusters based on either of the implemented internal clustering validation indices. Additionally, if the CSV file contains a column titled "True_Clusters" containing true clusters membership for each object, you can use it to validate clustering performance. 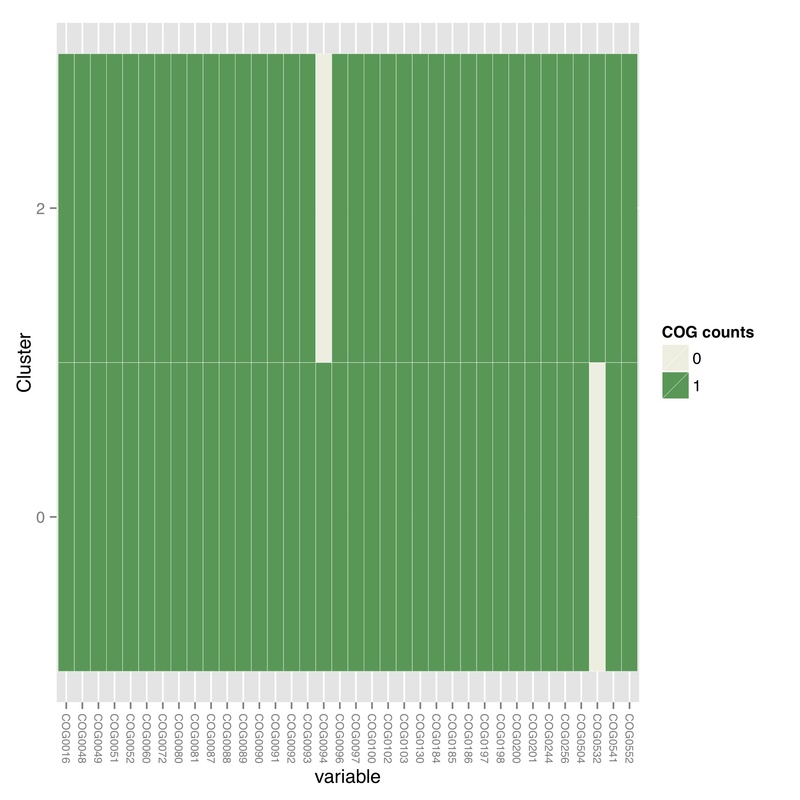 Finally, we filtered for COGs representing a majority of the subject to ensure fragmented genes are not over-counted and generated a table of counts of single-copy core genes in each cluster generated by CONCOCT. Remember to use a real email adress, this is supplied since information is fetched from ncbi using their service eutils, and the email is required to let them know who you are. The script requires the clustering output by concoct concoct-output/clustering_gt1000.csv, a file listing a set of SCGs (e.g. 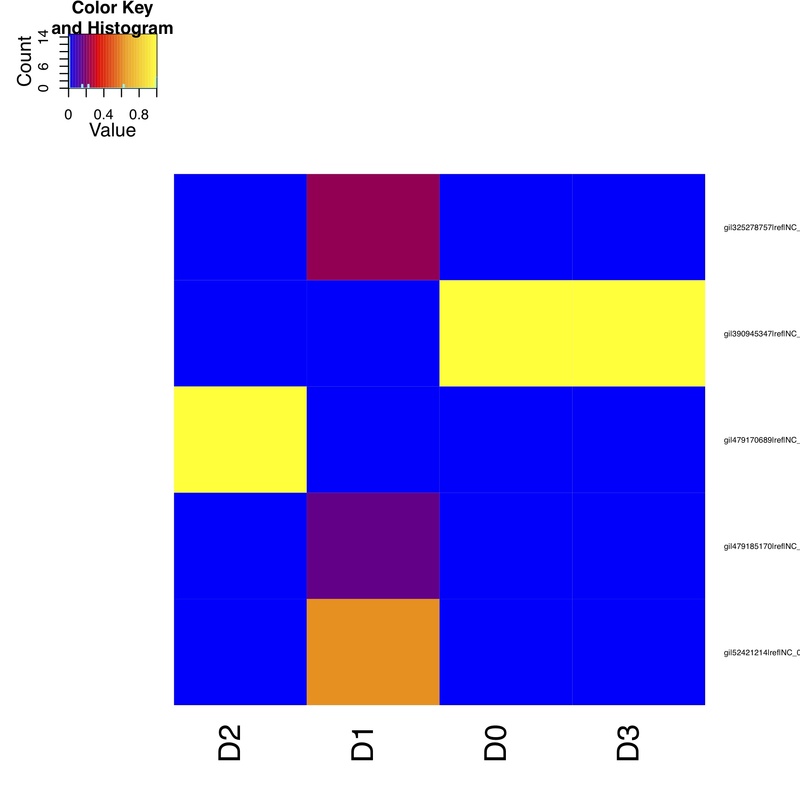 a set of COG ids) to use scgs/scg_cogs_min0.97_max1.03_unique_genera.txt and a mapping of Conserved Domain Database ids to COG ids $CONCOCT/scgs/cdd_to_cog.tsv. If these protein sequences were generated by PROKKA, the names of the contig ids needed to be recovered from the GFF file. Since prodigal has been used, the contig ids instead are recovered from the protein ids using a separator character, in which case only the string before (the last instance of) the separator will be used as contig id in the annotation file. In the case of prodigal the separator that should be used is _ and this is the default value, but other characters can be given through the -separator argument. The output file is a tab-separated file with basic information about the clusters (cluster id, ids of contigs in cluster and number of contigs in cluster) in the first three columns, and counts of the different SCGs in the following columns. Last Updated by Dr Umer Zeeshan Ijaz on 4/2/2015.